Here we have two publications, the one on the right superseding the one on the left. Everything in the later one is word for word what is in the earlier one. But it is only 29 pages whereas the earlier one has 32 pages. The mystery object is the content or theme of the 3 pages that have now been dropped. Blank pages headed "NOTES", because later manuals were not intended to be written in. That's a good suggestion Wally but this is not related to that. Curiously the early one has no security classification marked but the later one is Restricted. Not directly Empire related Gordon, but none the less a reflection of changing times. Good line of thought Chris & you are clearly wary of lateral thought catches such as blank pages. 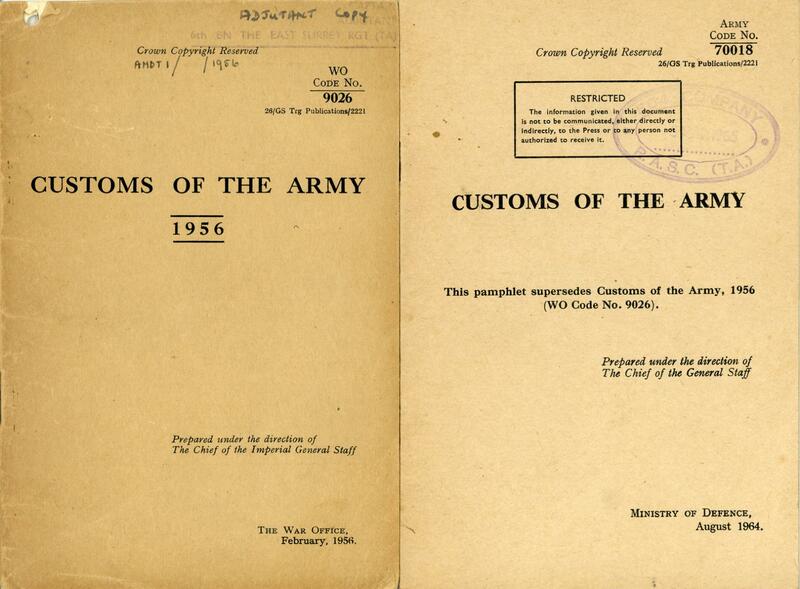 But these two and a half pages have content that was no longer considered appropriate to Army life in 1964. A good thought Gordon but this is more related to social change. Something to do with women's changing role? Another plausible one Wally but this not political or strategic but social. Picking up on the social changes Bernard. It could well have been something like that but its something else. Another good idea Wally but these are customs rather than legal matters. 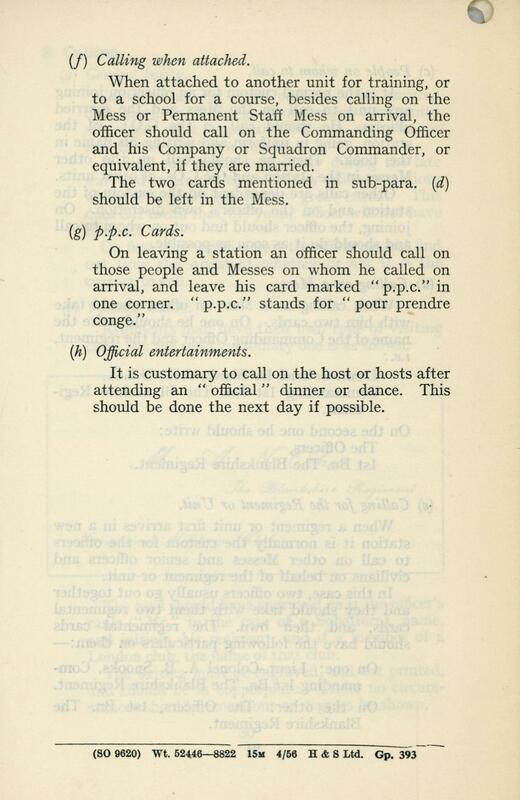 "This pamphlet is intended to give an Officer Cadet about to be commissioned an idea of some of the things to look out for on joining his regiment or corps." 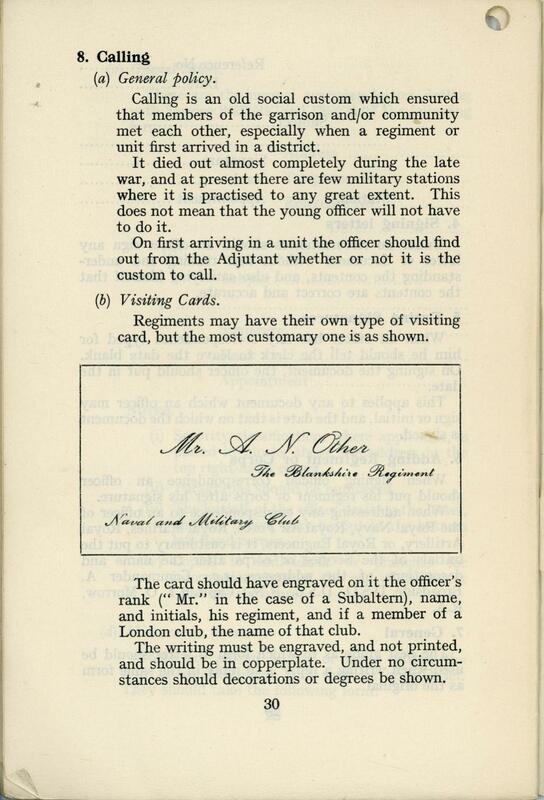 At least part of it will be the sending of visiting cards to the other officers of his mess. Yes well done Chris, you are on form tonight! After reading the instructions, I am still no clearer on the process, nor what it is supposed to achieve. 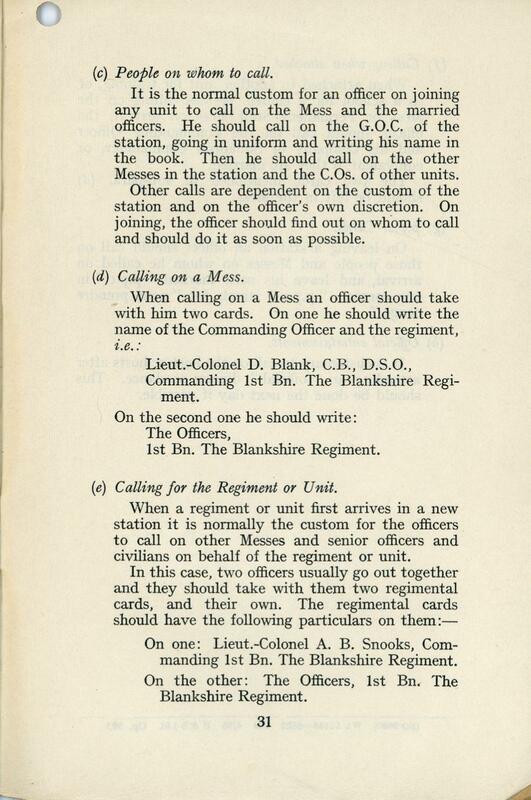 I suppose it is to show that you are a thoroughly good fellow and as a new boy engratiate yourself with your superiors who will recognise you as someone polite and subservient who will fit into the established rituals and structure of hierarchy within the regiment. I quite agree Clive, it is a pity that these norms are not now part of the modern world.